Will older people use smart technologies designed to improve the quality of their lives? Smart technology or gerontechnology devices or solutions, including telehealth, telecare, information and communication, and robotic options offer older adults throughout the world the promise of having more healthy, independent, comfortable, and active lives. This technology relies on sensors found in the bracelets, necklaces, clothing, watches, or smartphones of older adults, inserted in the walls, floors, lighting, appliances, or furniture of their dwellings, or even implanted in their bodies. Robots with human-like appearances may also incorporate these sensors. They can continually monitor and evaluate the physical health conditions of older persons, their cognitive (e.g., memory and reasoning) and sensory (e.g., hearing and vision) performance, physical agility, activities in their dwellings, and social connections. They also monitor the comfort, safety, and security of their homes by measuring their air pollutants, dampness, water leaks, mold, bacterial infections, poor lighting or visibility, accident risks, and extreme temperature conditions. These sensors communicate their monitored information to older persons and designated family members and professionals who can respond to their unmet needs or problems. Fig. 1. Theoretical model to explain the adoption of smart technology solutions by older persons. This paper proposes a theoretical model (Elderadopt) to explain whether older persons will be consumers or adopters of these new technologies. Many researchers have criticized past predictive models because of their unrealistic and oversimplified assumptions about older people’s adoption behaviors. The model proposes that four factors will directly inﬂuence whether older people will positively evaluate their smart technology options. First, it diﬀerentiates older people by how stressed they feel because of their physical and mental health conditions, mobility limitations, social isolation, and housing deficiencies. When older people feel that their problems are more serious, imminent, or will last longer, they are predicted to evaluate their technology options more positively. 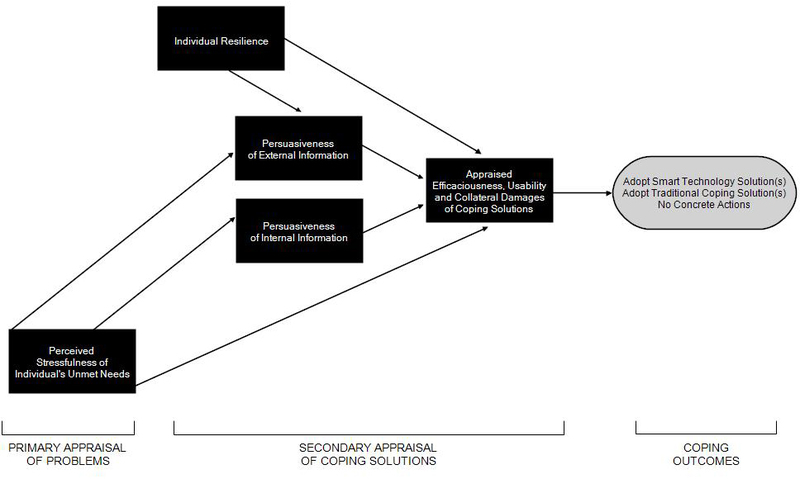 The model secondly diﬀerentiates older persons by their level of resilience, that is, by how conﬁdent they are in their abilities to deal with their problems (perceived self-efficacy) and by how open they are to novel ideas and approaches (adaptive flexibility). More resilient older persons who are more motivated to seek solutions are predicted to evaluate their technology options more positively. The third and fourth explanatory factors distinguish older people by how persuaded they are by the external and internal information they receive about their technological options. This information informs them about the features and operation of their possible smart technology solutions (denotative information), but also about how well they are likely to work or function (evaluative information). External information consists of communications from the media, medical and long-term care professionals, vendors promoting their products, and family and friends. Internal information consists of the remembered “direct experiences” of older people about past “things” (people, events, activities, objects) that influence their current assessments of these products. For example, an older woman might remember her good or bad experiences when she used technological devices in the past. The model proposes that the more persuaded (whether positively or negatively) older people are by their external and internal information, the more extremely positive or extremely negative will be their smart technology appraisals. When older people appraise or evaluate their technological options, the model proposes that they focus on information about three attributes: perceived eﬃcaciousness or usefulness, perceived ease of use, and perceived collateral damages (unintended harmful outcomes, such as assaults on their privacy). The more positively or less negatively older people evaluate these attributes, the more likely that they will adopt these smart technology products. A theoretical model to explain the smart technology adoption behaviors of elder consumers (Elderadopt).